On the coast in The Costa Tropical, Spain’s only Sub-Tropical region. A free Wi-Fi network covers the complex. Eagle Peak Naturist Resort Spain has six well equipped self-catering apartments each with south facing terraces and each enjoying magnificent sea views and overlooking the marina and the local naturist beach. Almunecar is a bustling, traditional Spanish town, unspoiled by tourism with another five naturist beaches nearby. 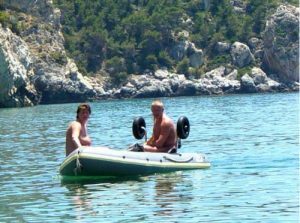 Unlike many naturist resorts, we welcome all, including single men, single women, couples, families and groups and are gay-friendly. We are a child-free resort. We are a clothes optional resort in that we do not admit non-naturists unless at least one of a couple is a confirmed naturist, this allows the other non-naturist to try the lifestyle among friendly naturist people with no pressure on them to conform. To date, we have 100% success rate. We know how hard it is to leave your family pet dog at home, so can bring your dog with you, no charge, but you must accept full responsibility for its behaviour. There is a lovely dog walking area within 100 metres of the complex. Sorry, no cats allowed. 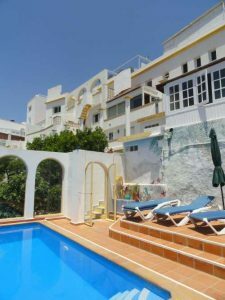 We have a lovely sheltered pool with surrounding sun terraces just waiting to help you achieve that all over tan. When you want a break from relaxing naked by the pool our Clubhouse offers a four-seater spa bath, TV and a self-service bar, and a 12 seater table for communal BBQ’s and parties all set within a comfortable social area. As the sun goes down, make free use of our BBQ facilities with an outdoor sheltered eating area. For dessert, why not pick Fresh Fruit from our very own Tropical Orchard with mangoes, lemons, oranges, bananas, custard apples and other tropical fruit depending on the season. We believe in offering good value for money to all of our guests and in addition to the usual range of facilities we offer a selection of free activities, conditions permitting. FREE – Secure Wi-Fi network covering the whole naturist resort. FREE Regular naturist dances in our pool area with live music, fun body-painting and friendly social gatherings. At Eagle Peak, you can take it easy and keep to yourself or join in the fun and activities of your choice. Discounts for recognized naturist association membership, long stays and “Escape the winter holidays”. FKK Specialists. Eagle Peak Naturist Resort Spain is situated on the coast on the west side of Almunecar, away from the nightlife and bustle of the main town, overlooking the beautiful coastline, a marina and an unspoilt naturist beach. Five other naturist beaches are nearby. Some you can drive down to, and some have restaurants on the beach. The nearest airports are Malaga and Granada both about an hours drive away. We are only 150 metres off the main N340 and easy to find.